Jemesii has started her own business on Etsy, and I’m busting with pride. 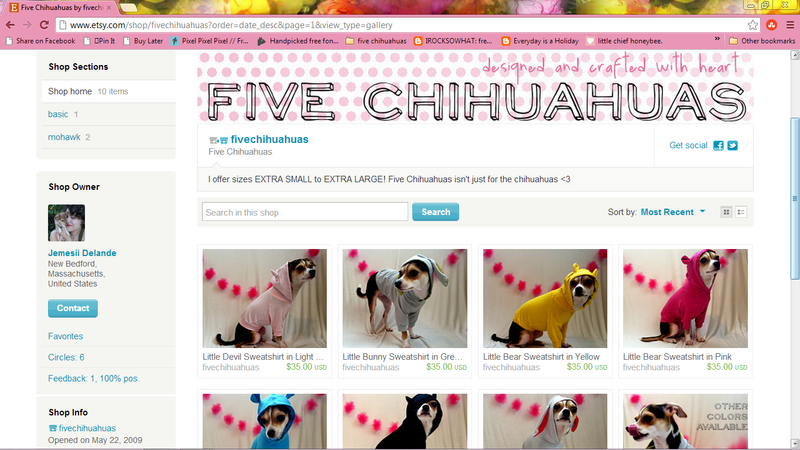 Five Chihuahuas offers a bevy of whimsical and warm sweatshirts for pooches large and small (sizes xs-xxl). Our daughter Jemesii has always been enormously creative. Although she possesses a degree in metal smithing, her love of adornment extends well beyond jewelry; shoes, tattoos, clothing and cupcakes–all beloved and bedazzled. 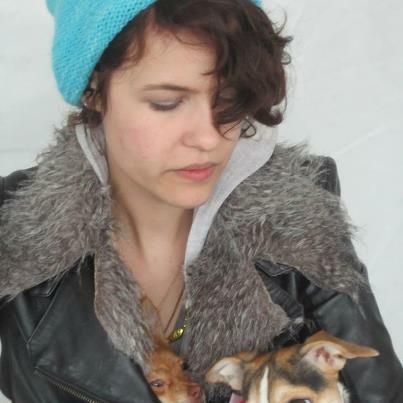 Five Chihuahuas is a wonderful fusion of Jem’s fashion sensibility and her devotion to animals. Not just canine couture, but a source* of comforting warmth when the temperature drops. As I said, couldn’t be prouder. *Always the advocate, Jemesii has a soft spot for rescue animals and some of her product will be donated to dogs with demodex mange, a debilitating but reversible condition that can be particularly severe in cases of neglect. 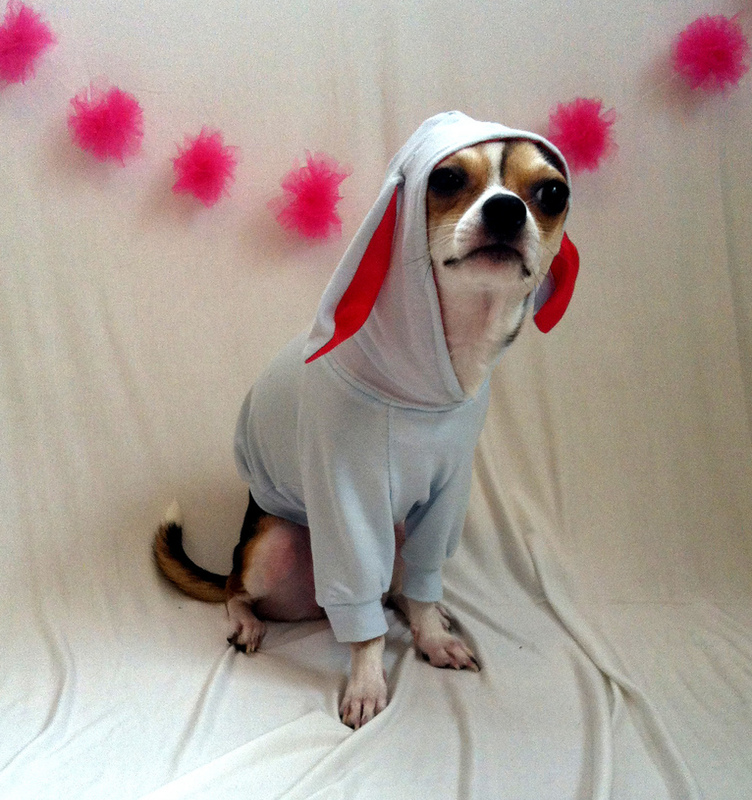 This entry was posted in Family and tagged canine couture, Five Chihuahuas, Jemesii Delande, sweatshirts for dogs. Bookmark the permalink. Pleasure’s all mine sweet pea! It is a wonderful write-up, Jemesii, but well-deserved, it seems. Those sweatshirts are just adorable. Happy pooches to be cuddled up in those, for sure! My little Grace is a street-dog from Puerto Rico and last Christmas my husband gave me a DNA test for her. Of course, lineage wasn’t important to someone who rescued a street-dog, but I was so interested to see what it would fine, figuring that there were so many combinations in her that it would be inconclusive. But to my surprise, one-half of Grace is 100% chihuahua! (The other half, not so easy.) It went back three generations, so she has to be first-generation-street-dog. She’s adorable and wonderful and I can see why you are pulled to chihuahuas! Best of luck in your business venture. I’m having an utter blast with this company and have already made a few connections with people who do rescues and have the demodex babies. Kala is indeed gorgeous! Love all the expressions as she models her treasures. When I adopted Grace, I was not expecting her to be a special needs dog (or at least not to the level) but she definitely it. There have been lots of challenging moments, but I wouldn’t change a thing. She has taught me more than I would have thought possible. And the mutual love runs deep. Quite special. It’s wonderful what you are doing to help the demodex condition, too. Kala came to us with some anxiety (she was weaned too early) and was present when her sister Olive was mauled earlier this year…. as a result she now has what I can only characterize as puppy PTSD. she needs some extra love and attention but shes in the right home for it! and my first demodex baby got her sweatshirts today!! thank you Catherine, I’m pretty excited! its been a great start; here’s to hoping the momentum continues! Adorable! Dave told me of Jem’s new business venture. Good luck to Five Chihuahuas! How are you doing? Please keep in touch. You’re on everyone’s minds here in Matty and beyond. I am so proud of Jem. She’s a crafty one! And please give a big howdy to my fam on the South Shore! I’ve got 2 chihuahuas and we could use some new swag :). Will definitely be checking out some new sweatshirts for them at her shop!